We’re kind of in that in-between season in the northern reaches of the Midwest. Many lakes are still covered with ice, although the quality of the ice is inconsistent. Everywhere else, anglers are fishing open water. The common theme is, anglers are anxious to go fishing, and most of us appreciate and relish every opportunity we get to do so. We want to be on the water chasing whatever it is that we like to chase, and it’s going to take a lot to keep us from doing that. Following are some ways you can enjoy your fishing even more this year. First thing: Go fishing whenever you get the chance. Don’t wait for perfect conditions. If you do, you won’t go fishing very often. If you’ve got a couple of free hours, grab a rod and put it to use. It’s a safe bet that there’s a body of water near you that has some fish in it. You might catch just a couple small ones, or you might hook into a big guy. It doesn’t matter, you’re fishing. Catching a few fish is better, way better, than not catching a few fish. I have a good number of very nice memories that were created on short, unplanned fishing trips. Don’t get too hung up on a particular species of fish. Chase the biters. Lots of anglers put a lot of effort into catching walleyes, or bass, or muskies, or whatever, and that’s fine. But if you just want to see your rod bend, every now and then this year, be a “whatever’s biting” kind of fisherman. Angler’s have lots of fishing options wherever they live. They can be after panfish or bigger predator fish. It’s important to have a plan when you go on the water, but we need to be flexible in that plan. If the walleyes aren’t interested in getting caught, try to catch a northern pike or a bass. Something is usually willing to get caught, and it’s a whole lot more fun to catch a bunch of bass than not catch any walleyes. Just as some anglers consider themselves to be a “walleye guy”, there are some anglers who describe themselves as a “jig fisherman”. “If they won’t eat a jig, I don’t want to catch’em”, I’ve heard these anglers say. And, if that’s how you like to fish, go for it. But if we expand our arsenal of fishing techniques, we’ll catch more fish and probably enjoy our fishing even more. Make this the year you expand your knowledge of fishing techniques. If you’re on a hot jig bite for walleyes, try using a live-bait rig. You’ll find that by trying different things when the fish are biting, you’ll get confidence in that technique and you’ll be a more well-versed angler. Well-versed anglers usually catch more fish. Sometimes when I go fishing, I just want to get something to pull back; I don’t care what it is: It doesn’t matter. This is when I tie on my go-to bait: An eighth or quarter ounce Slurp! Jig tipped with a plastic action tail grub. Everything eats this set-up. You can effectively fish it over and along a weedbed, a rip-rap bank, or along a shoreline that has a lot of boat docks. Pretty much any gamefish will eat this rig. Day-in and day-out a three inch tail will be better. 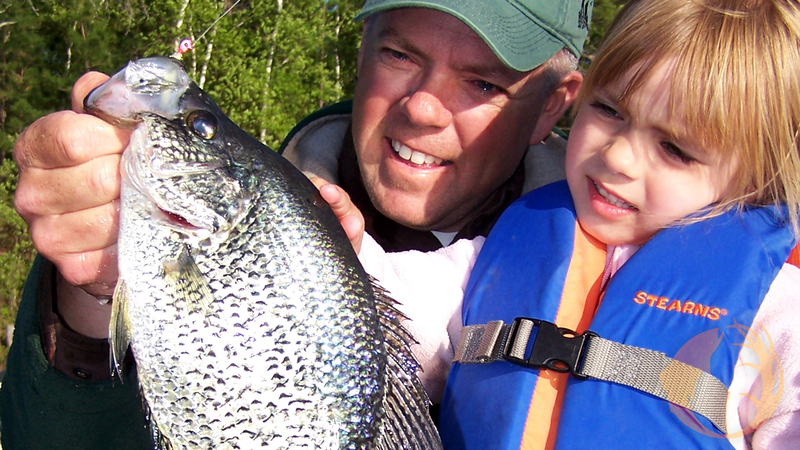 Go smaller for panfish, larger for bass. The Slurp! Jig is recommended because it was built for plastic. The upcoming year can be your best ever for fishing if you make the time to go and put your bait in front of willing biters. But you need to find that out for yourself. Feature Photo: A jig/plastic tail combination got this early season crappie to bite. Jigs and plastic are fish-catchers year ‘round.